Summer is here. Every time Ella goes shopping with me "Mom can we buy corn on the cob". How do you say no to that. She loves it and still eats it even though she still doesn't have her to front teeth. I have to admit I hate making corn on the stove, I never know when its done and I don't use the grill (Brian does all that) so I had to find an alternative. For Mother's Day I got an Instant Pot and I am in love. 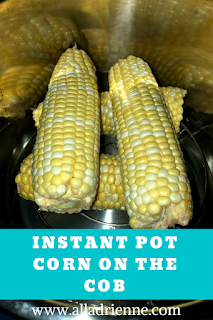 I love how easy it is to use and it makes delicious corn on the cob in 2 minutes. 1- Place steam rack in bottom of Instant Pot. 2- Add 1 cup of water. 3- Add corn in a criss cross pattern. 5- Hit the manual button and set timer for 2 minutes. 6- Once done do a pressure release. 7- Once all pressure released remove lid. 8- Let cool a few minutes.